Published on Saturday, July 2, 2016. This article appears in the June/July 2016 issue of American Craft Magazine. 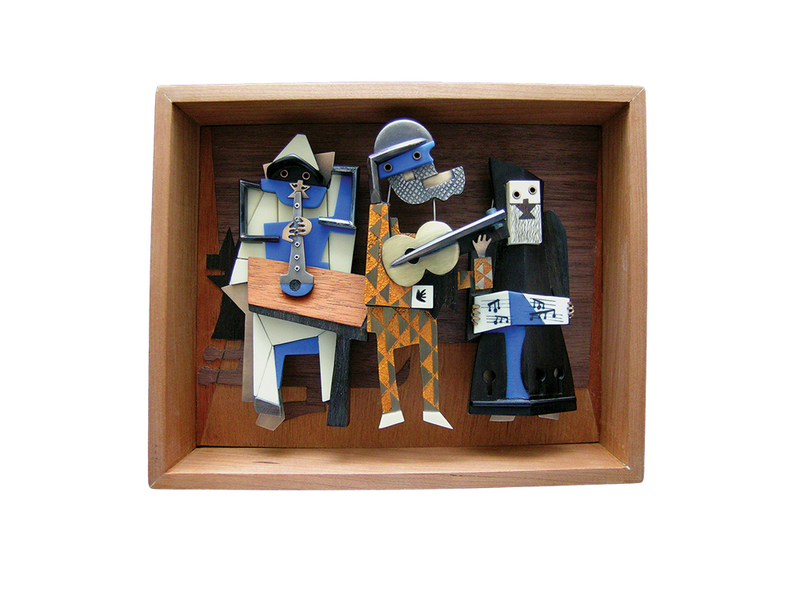 This trio of removable brooches (2011) is an homage to Picasso’s Three Musicians. Made of cello, violin, saxophone, clarinet, and piano parts, they are held in place by magnets. Kids don’t like to practice their musical instruments. That’s what Lisa and Scott Cylinder might have concluded a decade ago, when their 14-year-old daughter took a screwdriver to an old clarinet and proceeded to disassemble it into all its components. As it turned out, their daughter was only following the instructions of the music technician at her high school, in case her own tip-top clarinet needed repairs while she toured with the school orchestra. Her parents, professional jewelry makers, made space for the old parts in their studio – where, gradually, their interest was piqued by the nickel-silver clarinet keys and rods. 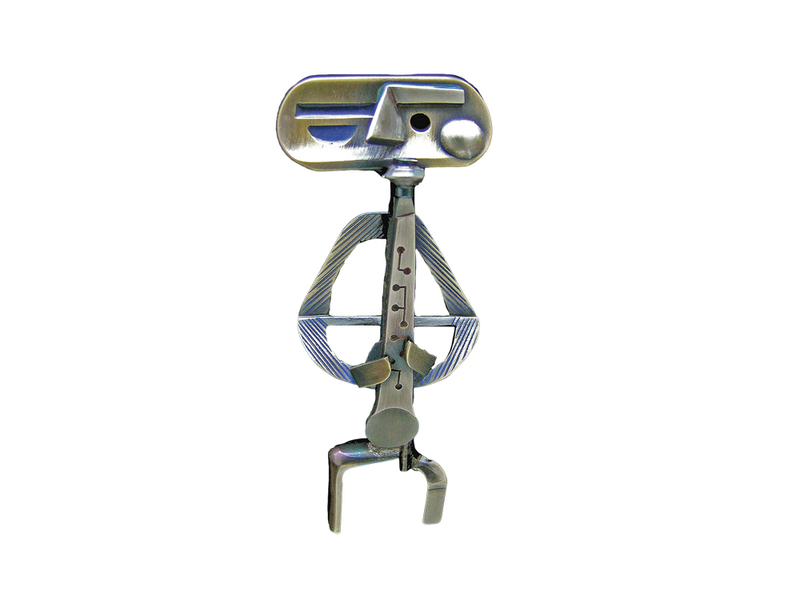 The Cylinders had long incorporated found objects such as game parts and tool components into their unique pieces. As they surveyed the new materials before them, they were intrigued. Adding musical instrument parts to their one-of-a-kind repertoire was an idea they couldn’t pass up. The Cylinders met at Tyler School of Art’s jewelry and metalsmithing program in the mid-1980s, and they have been working together ever since. Early on, they found that their marriage and business were best served when they worked on common goals, rather than letting their egos take the lead. They start on a new project only if both agree on it, sit- ting down together with their material collections and shared sketchbook. “We duke it out,” Scott says. “It’s a true exchange of ideas. Sometimes it gets heated, sometimes it’s calm. Sometimes we come to a decision on the first day. At other times, we cannot agree at all. After all, there are always two brains and four hands at work.” Any project they launch “has to click for both of us,” Scott says. From the first cut to the last glossy coating, Lisa, 52, and Scott, 51, collaborate on every piece. Yet there is a division of labor: Lisa handles most of the prep work – the sawing, piercing, and gathering of parts. Scott does all of the soldering and epoxy casting, and most of the final cold connections, as well as the patinas. And Lisa does the final finish work, the gold-leafing and enamel painting. They both carve. “Most pieces pass back and forth between us dozens of times. We know what we are good at individually, and we stick to that,” Lisa explains. They work only with discarded instruments they buy from flea markets and eBay. 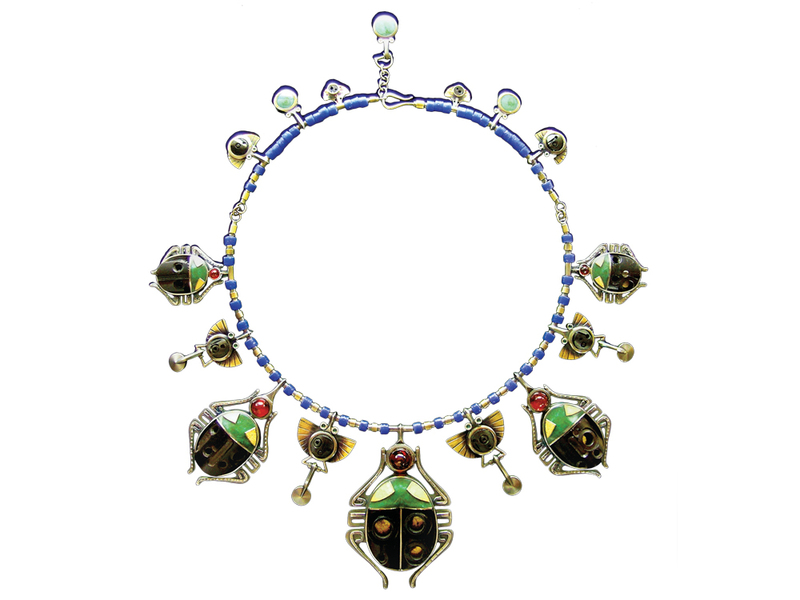 “No new instruments are ever harmed in the making of this jewelry,” Lisa says. Just as their work has evolved, so have their personal tastes. “When I met Scott, I almost exclusively preferred antiques and decorative items. I wasn’t really interested in anything modern at all. But I have come a long way,” says Lisa. Scott confesses he would never have even glanced at a René Lalique piece, but once they decided to become a team, he found that there were many forms of creative expression they were equally struck by. “For the first 10 years, we had to truly learn how to work together, because this was our livelihood. This was how we were feeding our family [of four],” says Lisa. 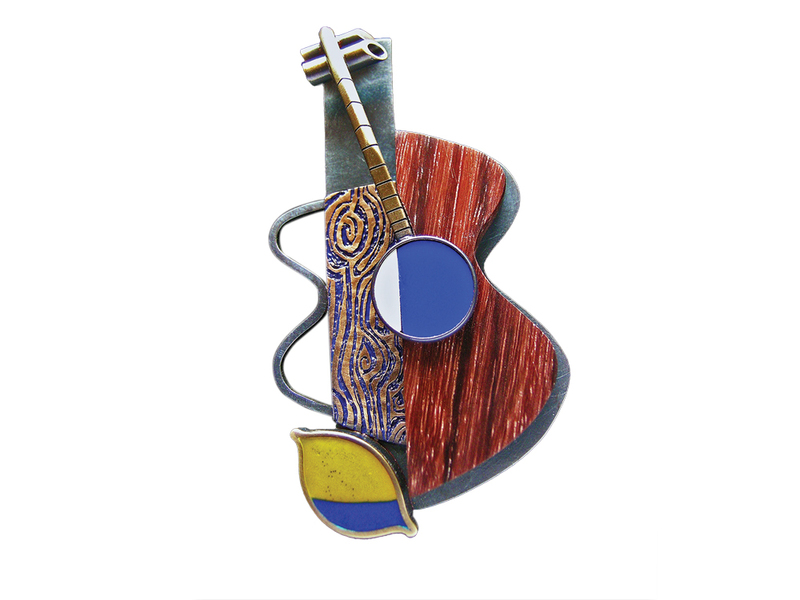 Rhythm Still Life Guitar brooch/pendant (2014), incorporating a vintage saxophone key, shows off the duo’s fabrication skills. Blue Clarinetist brooch/pendant (2012), of sax and clarinet parts, comes with a box that doubles as a miniature stage. Lisa and Scott Cylinder’s Scarab Clarinet necklace (2012) lavishly reimagines vintage clarinet keys with Bakelite and glass. 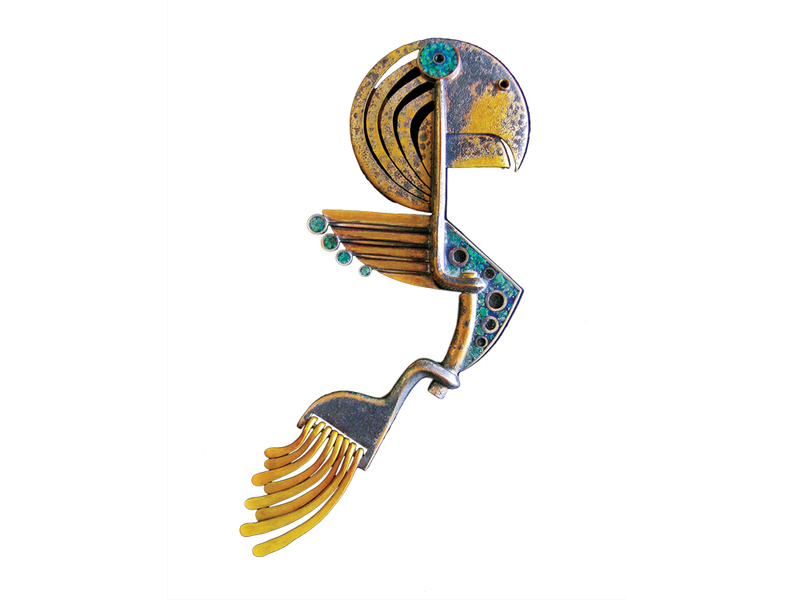 Saxophone parts give the Parrot Post-Columbian Saxophone brooch/pendant (2009) a kinetic tail. 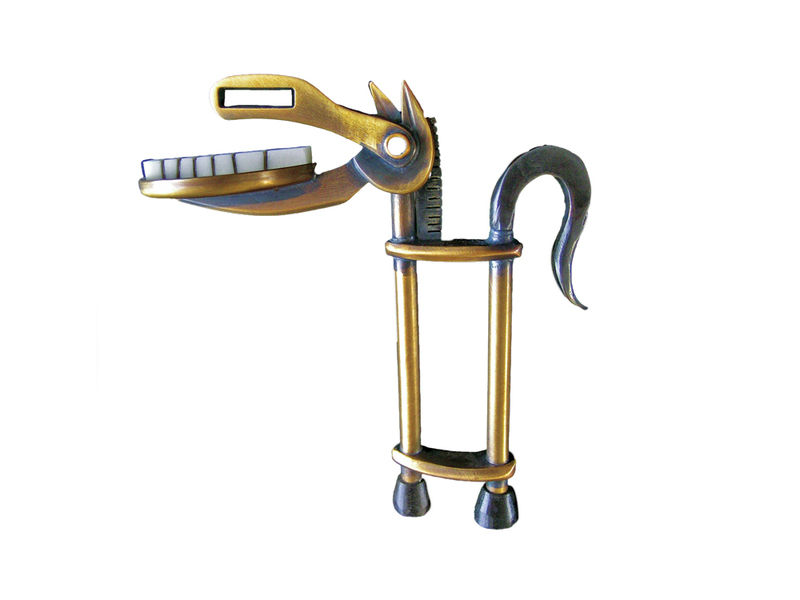 The ebony on the Rocinante Post-Columbian Saxophone brooch/object (2009) is from a violin tuning peg.